Marshmallow Caramel Pops are three great tastes in one easy-to-carry candy! 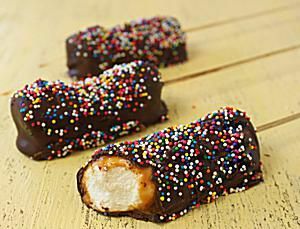 Marshmallows are coated in a layer of caramel, then dunked in chocolate and decorated with sprinkles. If you want to play around, try using different flavors of marshmallows or candy coating, or top them with nuts or coconut instead. 2. Skewer three marshmallows on the end of a wooden skewer, pushing them up against each other. Repeat until all 12 of your skewers have 3 marshmallows each. 3. Unwrap the caramels and place them in a microwave-safe bowl with 1 Tbsp. of water. Microwave the caramels in 30-second bursts, stirring after every 30 seconds, until they are melted and smooth. If they are very stiff, add a bit more water, until they get to a spoonable consistency. You don't want the caramel to be too runny, so don't add any more water than is necessary to be able to pour the caramel. 4. Hold one skewer's marshmallows over the bowl of caramel, and spoon the caramel over the marshmallows. (It will be too thick to simply dunk them in.) Rotate the marshmallows and continue spooning the caramel until the marshmallows are completely covered. Let the excess drip back into the bowl, then place the dipped marshmallows on the prepared baking sheet. Repeat until all of the marshmallows are covered with a layer of caramel. 5. Refrigerate the tray to set the caramel, for about 20 minutes. 6. Once the caramel is set, check the pops and if any caramel has pooled at the bottom, use your hands to smooth it back around the marshmallows—this is fairly easy to do once the caramel is thick again. 7. Melt the chocolate candy coating until it is completely fluid and smooth. Dip a caramel-covered pop completely in the chocolate, then let the excess drip back into the bowl. Place the chocolate pop on a baking sheet and, while the chocolate is still wet, sprinkle it with sprinkles, nuts, coconut, or any other decorations you desire. Repeat until all of the pops are dipped in chocolate. 8. Refrigerate the tray to set the chocolate, for about 15 minutes. Store Marshmallow Caramel Pops in an airtight container at room temperature for up to a week.